As a generally peace loving individual I should rejoice over the signing today of a mutual non-aggression understanding between two feuding factions in Lebanon. But I am not! So Hezbollah and the 15 or so Salafist (read Sunni hard-liners) groups have finally agreed to settle their theological and ideological differences through ‘rational’ dialogue as opposed to Rocket Propelled Grenades. It took dozens of casualties to get to this point and the fact that the Salafists couldn’t find enough in common between them to join hands under one banner should be enough to predict the chances of success. Can a duly signed sheet of paper resist the instinctive fundamentalist urges to eliminate any discordance through fire and steel? Even putting my cynical attitude to one side the answer is still a resounding No! But even if it did work, I will still be far from happy. It is hard to feel part of such a historic moment where One Muslim decides not to spill the blood of another Muslim…when one is not a Muslim. In fact I should probably be more concerned. For when spilling someone’s blood seems to be the only way forward in the struggle against Zionism and Imperialism a simple statistical calculation will make it obvious that this blood is more likely to be mine now than it was last week. On a practical level the choice of interlocutor puts the strategy of the resistance to the test. Once committed to reassuring the Christian Street it revelled in the assertion by its Aounist Allies that the real threat came from Sunni extremists lurking behind the respectable façade of Hariri’s Future (Al-Mustaqbal) Movement. While the latest evidence from Tripoli confirms that on a local level these groups might have at least cooperated if not fused militarily, the signature of the accord with Hezbollah gives the impression that the Salafists are now on an equal footing with the Shiite group. A fact that will not escape its secular detractors but more importantly the Christian electorate in the run-up to the 2009 parliamentary elections. Reflecting further, it seems this agreement is a reminder of a time when killing a goat belonging to one tribe might get you into serious trouble but slaughtering the entire herd of another tribe was considered OK for some strange reason only understandable to a few elders. Morality had nothing to do with it but prejudice, hierarchy, kinship did. Centuries of philosophical soul searching, Enlightened Monarchies, nationalist movements, Socialist revolutions, Liberal Reform have led to a Tribal gathering held by a small number of bearded men in an obscure Hotel. I despair! Call me Old fashioned but I am hoping for a return to a basic universal civil contract that guarantees my human rights as a citizen of a modern state. "Les factions sunnites libanaises qui avaient signé un accord de non-agression lundi avec le Hezbollah l'ont suspendu mardi". As the old saying goes: "3omrak aTwal min 3omri"! When I read the news of the agreement, I was planning to write a short article for the site, but you were faster! For me- as a die hard secularist and, somewhat old fashioned, leftist- what I find frightening in this event is not the fear that Joe refers to for the non-muslims. I am not trying to belittle this instinctive fear that Lebanese sects desperately want to instill in one another. However, if we all see each other as muslims vs christians or shi3as vs sunnis and politicize accordingly, then secterianism's triumph will be final and we would have all turned into goats ready for slaughter! No, what I find truly frightening is that this agreement is not a political agreement. Rather, it is essentially a non-aggression treaty! In other words the type of document usually signed between two independent states with potential to go to war. There has been, for a while now, a very conscious decision made- chiefly by hardline elements within the Saudi regime- and with full support of the current US administration to redraw the conflict fault lines in the middle east- and indeed state borders- to shi3as vs. sunnis, with the disastrous consequences we see in Iraq and a glimpse of which we saw in Tripoli. The aborted agreement between the Lebanese shi3a and sunni fundamentalists is a clear sign that these fault lines have well and truly reached Lebanon. When you see fault lines, you can only ask one question: when is the earthquake coming, and how much of the arab world will lie in ruins in its aftermath? Whether this non aggression treaty failed on the second day or was implemented here is not the question. The problem in my opinion resides in the initiative of communities to dare taking such steps. If by definition the conditions for a state to emerge are the “consent of citizens, living on a same territory, to live together, and to concede their right of coercion to one institution ran by the political power”, this means simply that every state is built on the notion of a social contract. The JJ Rousseau contract being labeled as a utopia, it becomes more accurate to view the emergence of a state as a manifestation of Thomas Hobbes’ notion of contract, where the different groups give up their natural power and right to use violence to one body Hobbes calls the Leviathan (which is practically the State). 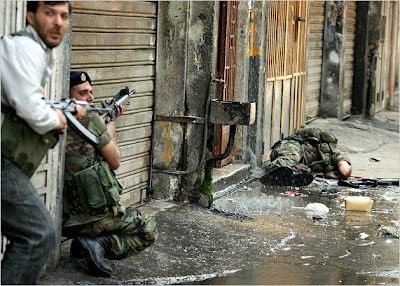 What we are witnessing in Lebanon now is a ground being perfectly prepared for a civil war. A ground where communities build parallel contracts between each others as if they were “mini states”. Each time such deal is sealed, it is a new taboo broken on the way to a civil war, because simply, every such contract is taking from the state its prerogative of running and supervising its groups and citizens interests fairly. This has not started two days ago, it did with the treaty Hezbollah signed with the aounists a couple of years ago. And even if the one with the salafists failed, others will succeed because we’re apparently on the “right track” towards blowing it all up…again! The problem is then our vision of the state. And as long as it is seen as the mirror reflecting the religious communities’ equilibrium, it will fail. And only when we will decide to make it a laic entity that will guarantee to all its citizens the human, civil and political rights, then we can pretend starting the process of building a real civil peace. Bassem, I chose to write it from a very instinctive perspective as you mentioned because the event is so absurd on a basic level and even by Lebanese standards. . And as Bashir points out this is a sign of the overt desintegration of the Lebanese model of the State with the blessing of our politicans. Time for all of us to wake up and smell the coffee.